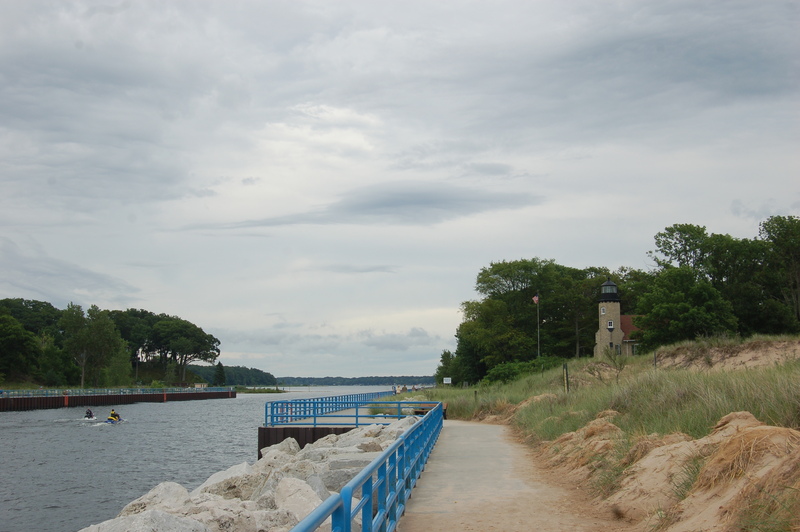 Summer attracts hundreds of thousands of visitors to the beaches and iconic lighthouses at Holland, Grand Haven and Muskegon State Parks each year. 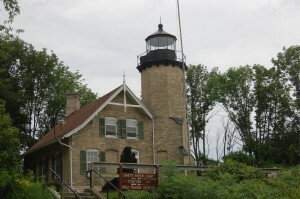 These three lights are among the most-viewed in the state (and deservedly so), but there are many other scenic and noteworthy lighthouses on the Lake Michigan shore – a trip north of Muskegon to Whitehall and the White River Lighthouse provides a less-crowded place to enjoy a historic beacon, tour its museum and even climb the tower. White River drains into White Lake before emptying into Lake Michigan, and the lighthouse guards a channel that connects the two lakes. This area saw a timber industry boom around the 1870s, as hundreds of vessels entered White Lake moving millions of board feet of lumber. 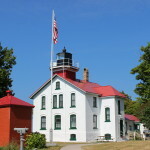 The current lighthouse first activate its beacon in 1876, replacing a pierhead light. The tower is 38 feet tall and provides great views of both lakes from its lantern room. 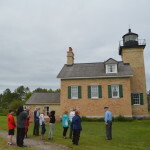 This was the first lighthouse we ever entered or climbed, and it helped spur on our interest in visiting more of Michigan’s historical beacons. 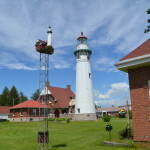 Those with a keen eye may note structural similarities between this lighthouse and the ones at McGulpin Point near Mackinaw City and the Eagle Harbor Lighthouse on the Keweenaw Peninsula. 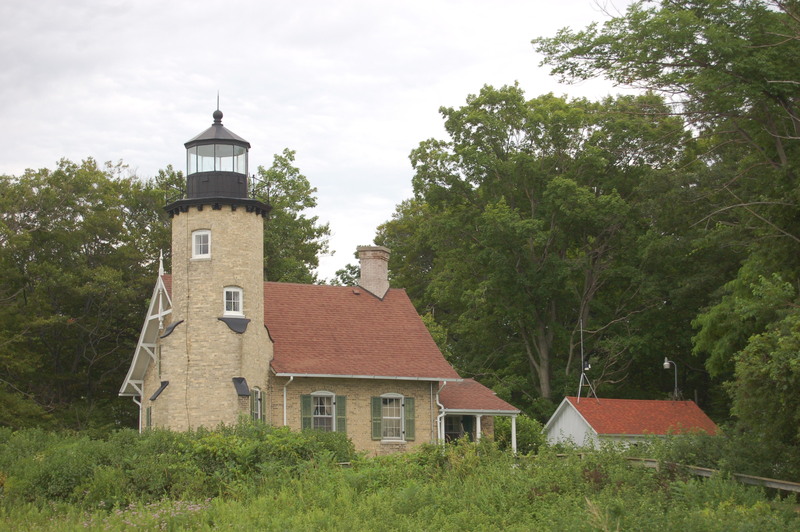 It is constructed with light-colored bricks, and the tower is capped with a black metal lantern room. The light was automated in the early 1900s, and this site has been active as a museum since 1970. Since 2012, this lighthouse is one of four managed by the Sable Points Lighthouse Keepers Association (Big Sable, Little Sable and the Ludington Pierhead Light are the others). From late May until October the site is open Tuesday through Sunday, 10 am to 5 pm. 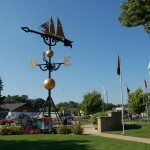 More details are available at http://splka.org/whiteriver.html. 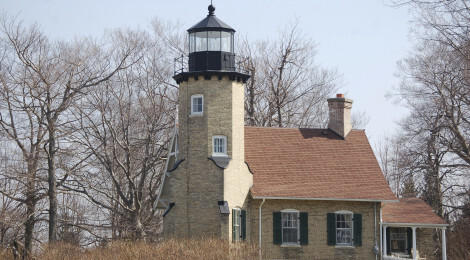 To get to the lighthouse, take US-31 to the White Lake Dr. exit. Turn right (heading west) on to South Shore Drive. 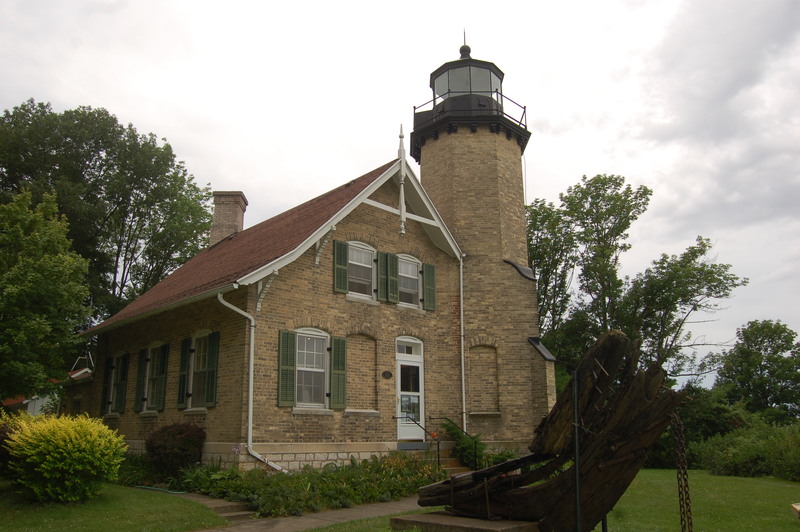 Turn left and continue following signs for the lighthouse and museum to the end of Murray Road.